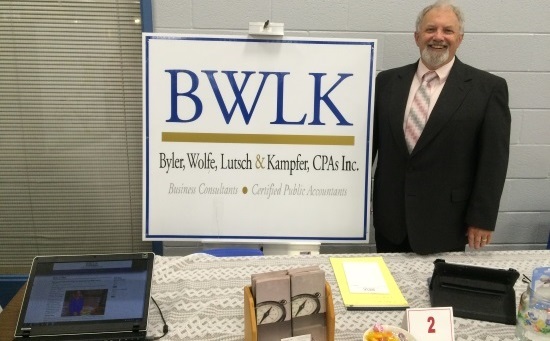 BWLK principal Daniel D. Wolfe at the July 2015 chamber of commerce expo. A. Listening, understanding, intuitiveness. Though some do not, all accountants should have the technical skills to perform their jobs, especially in the areas of their concentration, but there is something above those skills need to make a “good” accountant. I think a good accountant will partner up with clients and become an integral part of the client’s organization. In order to achieve this level, I believe you need listen, understand and be intuitive. A. My primary area is taxation, but with my background, I find myself frequently working with business management and financial planning. Along with my 20+ years in public accounting, I have 16 years of manufacturing experience as vice president, chief financial officer and human resources director. I also have passed my Series 65 exam that allows me to be a registered investment advisor representative. Q. Does being a CPA bring community responsibilities? A. Being a CPA creates a skill set that can be valuable in any size community. I have always felt a responsibility to use my skills to support the community I live and work in. I am the current president of the Southern Columbiana County Regional Chamber of Commerce, trustee of Roberts Wesleyan College and Northeastern Seminary (Rochester, NY), a member of the board of directors at Columbiana County Memorial Park, past chairman of the board of Tri-State Federal Credit Union and past president of Calcutta Rotary. I have held several positions in my local church and the associated district of churches. A. I came in through the back door. Going into my senior year of high school, my game plan was to major in music until I became concerned that this would lead to being a high school band director (please, no offense to band directors). While dealing with this dilemma, I happened to speak with a local CPA who asked about my plans and I answered, “I guess major in business,” with no clue what that really meant. He suggested accounting and said, “If you major in accounting, you can get a job and migrate to any other part of business you may like from there.” As simple as that sounds, it made perfect sense to me. So here I am, and I never looked back. Q. What was the greatest moment in your career?